Background and Aims: Ayurveda is one of the most ancient prevailing medical sciences. The interpretation of dreams to understand one's mind is a valid concept in modern literature and has been extensively mentioned in treatises of Ayurveda. Study of Swapna (dream) in Ayurveda can be helpful for understanding prakriti (personality) and prognosticating an illness. We aim to study swapna on healthy volunteers to identify prakriti and to see if there is any relation between prakriti and dreams; also, to understand the auspicious and inauspicious Swapna in persons suffering from the psychiatric disorder for the assessment of prognosis. Methodology: Two study groups, Group 1 comprising of 100 healthy volunteers assessed using questionnaires based on dreams for the assessment of prakriti (QBD-AP) and self-report questionnaire to assess prakriti (SQ-AP), as defined in Ayurveda; and Group 2 comprised 60 patients diagnosed with a psychiatric disorder. QBD for A-auspicious dreams and B-inauspicious dreams (QBD-A and B) was administered. The cases were given clinical prognosis (CP) as good, fair, and bad based on the experience of the treating psychiatrist. The data were analyzed using appropriate statistical tool. Results: No statistical significance was seen on prakriti assessment by both methods, QBD-AP and SQ-AP (χ2 = 2.81, P = 0.093). No statistical significance was seen on two methods of disease prognosis based on QBD-A and B and CP (χ2 = 0.667, P = 0.414), suggesting convergence of two assessment methods. 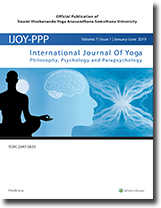 Conclusion: Prakriti assessment based on dream analysis and traditional ayurvedic methods converge and prakriti assessment can be done by observing dreams in healthy persons. Furthermore, auspicious and inauspicious dreams can be used as a prognostic marker for psychiatric disorders.